I do love to pop in to my local galleries on a completely random basis, (often to grab a coffee in addition to cultural input, it must be admitted!) The South London Gallery is a haven of the Camberwell/Peckham culture scene, and in addition to having a great cafe next door, shows pioneering contemporary British and international artists as part of its mission to “bring art to the people of south London”. The current exhibition of Slovakian artist Roman Ondak in the main gallery has uncovered the original Walter Crane marquetry panel inset into the gallery floor, and he uses the quote in the panel as his exhibition title; “The source of art is in the life of a people”. 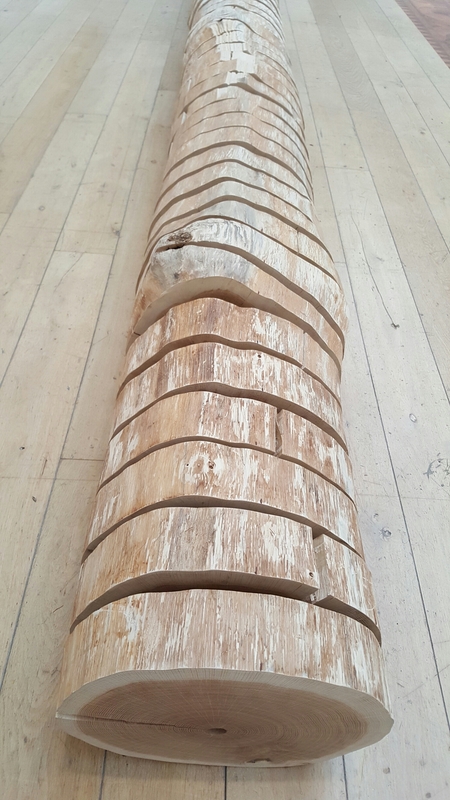 The exhibition lasts for one hundred days and a significant element of the work is an oak tree trunk sawn into one hundred disks, the disks have each been marked around one of its rings to represent a key historical event that happened in that year of the tree’s life. 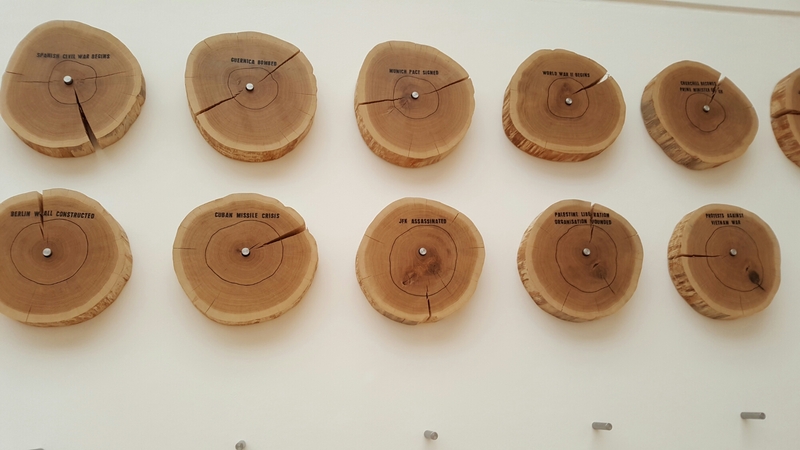 each day a new slice is mounted on the gallery wall and tracks the passage of time, demarcated by Ondak’s selection of significant events. it is fascinating to ‘read’ this timeline as it evolves through the show period, and realise that each of us has a different perspective of what we consider to be ‘significant’ historical events. 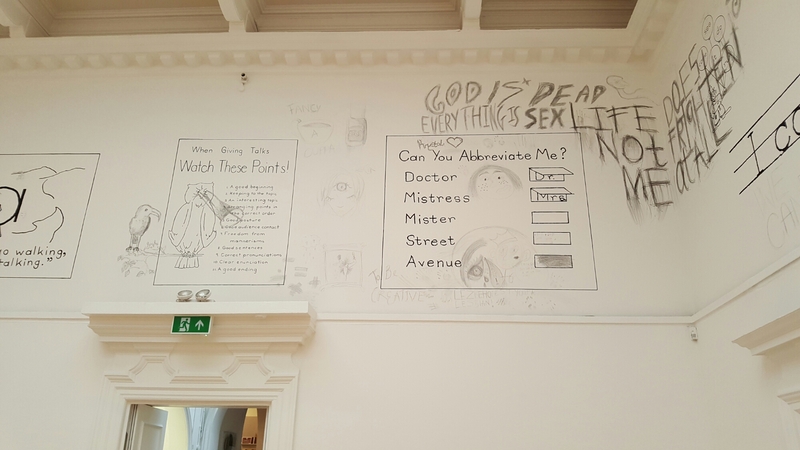 Roman Ondak has invited local young people to get involved in the creation of his work ‘Awesome Rules of Language’ where he has taken illustrations from a 1960’s textbook and recreated them on the walls of the gallery. 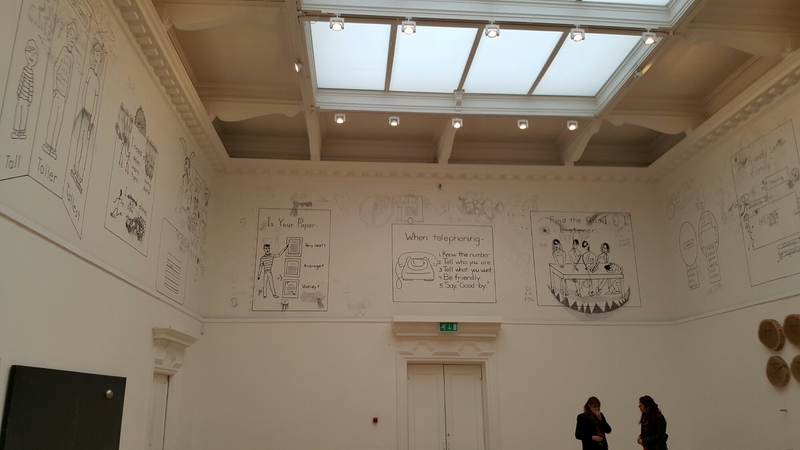 The illustrations have been drawn over by the adolescent collaborators and these doodles and comments have given a quirky contemporary twist as a commentary on social and educational norms. Still in the theme of education, Ondak has salvaged four large school blackboards from his native Slovenia, entitled ‘Four Moon Phases’ a bowl of a ladle is inserted into each of the boards, symbolising the four phases of the moon, referring again to the passage of time and the transition between past and present that informs our existence. I will certainly be popping back periodically to check what has happenned next in Ondak’s ‘tree of history’.